> Research Library > Fiserv > Not Ready for Insurtech? Here’s Proven Automation You Can Use Now! The right kind of insurtech can modernize the financial close, freeing up time, money and resources so businesses can focus on strategic efforts and specific customer needs. Reconciliation of transactions and accounts across large organizations is one area where automation and digitization can have a major impact on the balance sheet. In the article, Not Ready for Insurtech? 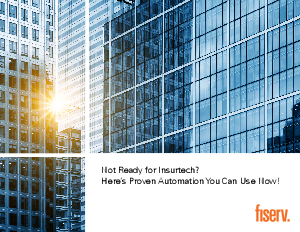 Here’s Proven Automation You Can Use Now!, learn how one of the top ten major insurance carriers has used digitization for the past decade to streamline their reconciliation efforts - saving time and money - while increasing their bottom line.